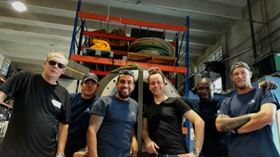 Subsea Global Solutions engineers are trained in Miami by seal experts from Lagersmit. SGS is an underwater repair, maintenance and marine solutions provider for the global marine industry. SGS has professionally trained divers and technicians to carry out repairs previously possible only out of the water. Bonding new seal rings, removal or installation of spacer rings, and complete replacements can be performed at anchor or during cargo handling operations without interference with the vessel’s schedule.